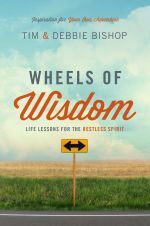 In Wheels of Wisdom: Life Lessons for the Restless Spirit, Tim and Debby Bishop share their lessons learned during their three tours which took them along over 10,000 miles across the States. Throughout their bicycle tours they blogged about their adventures and lessons. A collection of 60 lessons now fill their latest book. Think of enjoying every small blessing, overcoming obstacles, the importance of rest, seeing miracles happen, and the countless ‘coincidental’ meetings with people. Each lesson is introduced by a headline, a lively description of the events leading up to understanding this lesson, one or more pictures shot by the couple, a verse quoted from the Bible, and a couple of questions to reflect upon. The honesty and personal stories of mechanical damage, physical challenges, and mental barriers gives the couple sufficient credibility to relate to. Their tour as newlyweds from the Pacific to the Atlantic Ocean in 2010 – I remembered many stories from Two Are Better: Midlife Newlyweds Bicycle Coast to Coast -, the Mom-to-Mom tour from North to South along the Atlantic Ocean in 2012, and another coast-to-coast fundraising HopeLine Tour in 2014, are inspiring, confronting, and uplifting. We’re all travelers on a life journey and need help every now and then. Learn from this couple while you’re dreaming of new adventures, pondering about past travels, and live in the here and now. Tim and Debbie Bishop have co-authored three books about their midlife launch into marriage and cross-country bicycle touring. Two Are Better: Midlife Newlyweds Bicycle Coast to Coast captures the story behind the stories, while Bicycle Touring How-To: What We Learned shares their knowledge with bicycle touring wannabes. Now, Wheels of Wisdom: Life Lessons for the Restless Spirit conveys some deeper truths that apply to virtually any life pursuit. The Bishops serve as volunteer Hope Coaches for TheHopeLine, a nonprofit organization that seeks to reach, rescue, and restore hurting teens and young adults. They are available for speaking engagements about their touring and life experiences. They blog at www.openroadpress.com. In addition to consulting for small businesses, Tim Bishop has written Hedging Commodity Price Risk: A Small Business Perspective, an ebook that explains hedging concepts in easy-to-understand language with practical examples. He has over thirty years of business experience and blogs on hedging at http://hedging.openroadpress.com. Debbie Bishop has taught for over twenty-eight years. She has a passion for reading and seeing that young people do it well. She also has a strong interest in recovery issues and encouraging others with her own triumphs over such struggles earlier in her life. She is a featured author in Love is Out There by Melissa Williams-Pope, in which she relates her own story of finding love later than most. Debbie volunteers as a facilitator for www.findingbalance.com, an online support group dedicated to helping women who are struggling with eating disorders. Tim Bishop asked me to review this new book. I got a free review copy in exchange for my honest, personal impressions.